Pecan Cheese Wafers from Saveur Magazine. These were the BOMB! I was a goofy, disjointed mess at Friday’s ‘Tis the Season event at Central Baptist Church in North Little Rock, and that made it more fun. At least for me. I’m blaming my lingering cold, so there. This annual women’s event includes a potluck the likes of which you’ve never seen (including some Burge hams provided by the church), door prizes, and the highlight: choosing three of nine available classes on topics from hair braiding and games to cake decorating and my class, holiday cooking. Buy one good chef’s knife and learn how to use it. No need for a huge knife set! Maybe add a paring knife, and you’re set. I showed everyone my favorite santoku knife and said a regular chef’s knife is just peachy as well. Look for one in the $30-50 range for everyday use. I also demonstrated the very basics of knife work and how to cut things up safely. Take advantage of small appliances when tackling holiday cooking. For this class, we focused on the food processor and the magical things it can accomplish. Don’t be afraid to make a recipe your own! Take an old family favorite or something new you found online. Look in your cupboards for new ingredients you can use. Or just go crazy and make something up! Once you learn the basics of how ingredients go together (and I can help if you need it), the sky’s the limit. The first item I made is a cranberry relish I’ve served at several Thanksgiving and Christmas events over recent years, from the Simply Recipes blog. Since it’s not my recipe, just click the link to check it out! This relish is super simple, with just four ingredients, and it freezes beautifully. At the class I demonstrated in real time what happens if you overload your food processor with this recipe…you get perfectly-sized relish, with huge chunks of apple and orange throughout. Even if you have a big processor like mine, do half of the recipe at a time to ensure better uniformity, pulsing the processor until it’s just right. And if you have a meat grinder, use that instead for a PERFECT texture! The next item was a pecan cheese wafer from Saveur magazine’s website. This is an innovative twist on the spicy cheese cracker I’ve made before (as here in culinary school), adding a pecan half with an egg white as “glue.” The pecan’s sweetness perfectly balances the salty, spicy cracker. This recipe is easily made gluten-free, too, since there is very little flour used and the low-protein GF flour keeps the crackers light. I used Cup for Cup for mine. The final recipe was my own invention, a “Thanksgiving Dinner in a Bite” canapé (see below). This is the demonstration of tip #3 above, creating something completely different on your own. Using a few simple ingredients and fun techniques, I inventioneered this while planning the class. I couldn’t taste-test due to my gluten problem, but class visitors said it was pretty good! Somehow I managed to not take a photo both times I made it, so you’ll have to trust me. It’s pretty cute. If you attended, thanks for coming by, and sorry I was a little crazy! But as I said, life is more fun that way, right? Let me know if you make any of these, and let me know if I can help! Preheat your oven to 325 degrees, and move the puff pastry and the cream cheese to the countertop about 30 minutes before starting the recipe. The puff pastry should still be cool when you’re ready to cut out your circles. Dust a smooth working surface with flour and unfold the puff pastry onto it, then dust the top of the pastry with flour as well. Using a rolling pin or similar device, roll the pastry out just slightly to smooth it out. Press straight down into the puff pastry with a 1 1/2″ round or scalloped cutter and move the cut rounds onto a baking sheet lined with a silicone mat or parchment paper. The sharper the cutter is, the easier this step will be and the higher the rounds will puff. Bake the rounds for 10 minutes, then remove from the oven and punch down in the middle with the round end of a wooden spoon or similar utensil. Place back in the oven for 2-3 minutes or until the rounds are slightly browned on the bottom. Allow the baked rounds to cool before filling. If you would like to lighten up the cream cheese, mix it thoroughly with the sour cream or plain yogurt. (It’s fine without it, just a bit heavier.) Place the cream cheese or the mixture into a piping bag or a freezer bag (don’t use a standard sandwich bag or the seams will burst). Cut off a corner and pipe a small amount, maybe a half teaspoon, into each baked puff pastry round. Scoop a 1/2 teaspoon or so of the cranberry relish on top of the turkey, and garnish with the chives if you want. Pretty and delish! 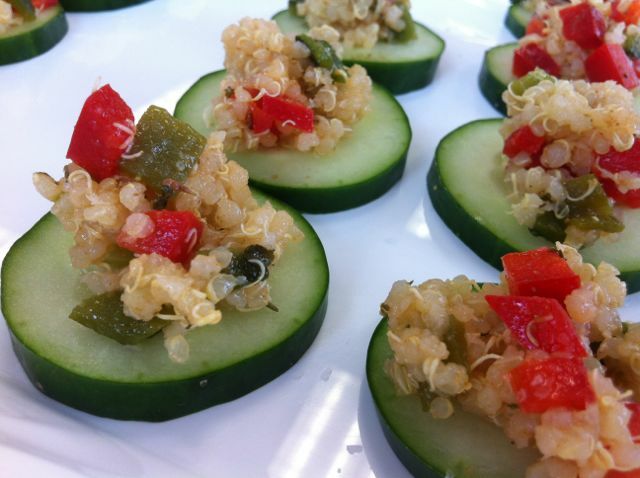 Attendees at the North Little Rock Vitamin Shoppe’s Share the Health event loved these Poblano Quinoa Cucumber Bites with Cumin Vinaigrette. This weekend I participated in the national “Share the Health” expo held at Vitamin Shoppes nationwide, setting up camp at my local store in North Little Rock. While others demonstrated taekwondo and sold bikes, I whipped up samples of this tasty quinoa salad. Even the healthy-food averse were converted. Hallelujah! I served the salad cold atop tiny rounds of fresh cucumber, but it could be served as a meal component or salad all by itself, warm or chilled. Here’s the recipe, as promised to those in attendance. I think you’ll love it! If the package states to do so, rinse and drain the quinoa. In a medium pot, heat the quinoa by itself over medium-high heat a minute or two, stirring occasionally, until slightly toasted, then add the broth and the garlic clove. Bring just to a boil, then reduce the heat to a simmer and cover. Cook according to package directions, probably about 15 minutes, until the quinoa is done and all the liquid is absorbed. Meanwhile, roast the poblano peppers. If you have a gas cooktop, this can be done there. Place one or both peppers directly on a burner and turn on the flame. When one side is charred, turn carefully with heat-resistant tongs. (Turn on the vent if you have one!) If you do not have a gas cooktop, you can do this under the broiler of your oven. Place the peppers on a baking sheet just under the broiler. Stand nearby and watch, turning with tongs when the top is charred. With either method, when all sides are charred, place the peppers in an airtight container such as a plastic storage bag or rigid container with a lid. Allow the peppers to steam while you continue. Chop the bell pepper, which we’ll use raw, into small dice. You can do this by cutting the pepper in half, carefully removing the white membranes and seeds with the tip of your knife, and slicing the pepper halves into very thin strips, about 1/8″ thick. Line the strips up and cut into small cubes. Place in a large bowl. By now your poblanos are ready to peel. Hold them under running cool water and scrub off the charred skin. If some skin wasn’t charred and doesn’t want to come off, don’t worry about it. Now dry the poblanos and cut the flesh into small pieces with the same method as the bell pepper. (Yeah, it will be more floppy, but it’s floppy deliciousness.) Add to the large bowl. In a jar, add together the olive oil, apple cider vinegar, Dijon mustard, herbs and cumin. Shake to combine, taste and add salt and pepper to taste. Keep it in the jar for now. When the quinoa is done and still warm, turn it out into the large bowl and gently mix it with the peppers, being careful to not crush the quinoa. Pour the vinaigrette over the mixture and fold it in gently. If possible, let this stand, covered, in the fridge for at least 4 hours before using. When you’re ready to serve, slice the cucumbers about 1/4″ thick. Sprinkle sparingly with kosher salt. (Skip the salt here if these will sit out a while, or they’ll weep.) Find the garlic in the salad and remove it. Using a small spoon or melon baller, place a small amount of the salad on top of the slices. Sprinkle with another bit of kosher salt and a dash of cumin. Add a small sprig of parsley or cilantro if you like. Prettied-up option that I skipped during my show: Before slicing the cucumber, use a vegetable peeler to make four or five stripes evenly around it. When you cut the slices, they’ll have a cool pattern and they’ll be easier to eat if the peel is tough. I so enjoyed making new friends at this show, especially those of you who had questions about how food changes can affect your health. I hope I can be of service to you. Stay in touch!